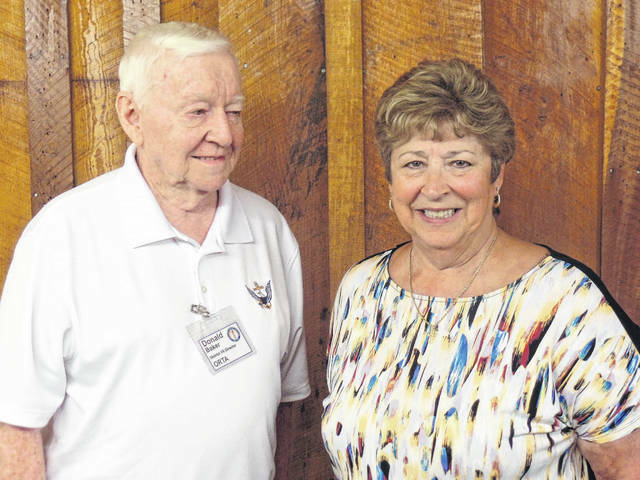 ORTA District Director Don Baker is pictured with Gallia County Retired Teacher President Ollie Paxton, right. RIO GRANDE — The Gallia County Retired Teachers met at noon on Aug. 10 at the Bob Evans Restaurant Event Barn in Rio Grande. The meeting was promptly called to order by President Ollie Paxton-Tipple. The Pledge of Allegiance was led by Sheryl Fallon and the blessing was given by Rick Howell. Thirty-seven members and guests were in attendance. A broasted chicken dinner prepared by the restaurant staff. July and August birthdays were recognized: Gail Belville, Marlene Hoffman, Lois Carter, Debbie Rhodes, Denise Payne, Doris Lanham and Ollie Tipple. Get well cards will be sent to Roy Sprague, Robin Lane, and Judy Burdell. Sympathy cards will be sent to Brent Saunders due to the loss of his father and to the family of Irene Surber. First time attendee, Joan Hudak, was welcomed. The treasurer’s report was given by Jack James and was approved by the membership. The minutes of the previous meeting were included in the last issue of The Slate and were also approved. Donna DeWitt gave the publicity report. Address changes for members were noted and the importance of keeping addresses current was emphasized. Teachers holding a permanent license must get a background check every five years and those living outside of the state of Ohio during the five year period must also get a BCI check or ODE will begin revoking permanent licenses. Gallia County Retired Teachers organization was featured in an article highlighting our scholarship recipients in the ORTA News Bulletin, July 2017. A new publicity chair will soon be needed for the organization so any interested person should contact Donna or President Ollie. Following this report, Karen Cornell asked that members continue to keep track of their volunteer hours. President Tipple introduced guest speaker, Don Baker, ORTA District Director. He updated the membership on several changes at ORTA and STRS. He encouraged the membership to stay active and emphasized the importance of building membership. New officers are needed for the upcoming year for a two-year term. President Tipple encouraged the membership to start thinking about taking a leadership role by volunteering for an office. Gail Belville brought it to the attention of the membership that if one becomes reemployed after retirement that one has to inform STRS and fill out a form to verify whether or not insurance is provided. Retirees have been failing to do this so STRS is going to be sending notices out to members one month prior to their birthday each year to remind them. Members were reminded to gather items for the December auction. The money from the auction will continue to build the scholarship fund, help defray the cost of mailing the newsletters, and/or contribute to our community service projects. Door prizes were given away through a raffle with many lucky winners. The following members and guests were in attendance: Lynn Arnott, Gail Belville, Barb Burnett, Lois Carter, Jean Cassidy, Irene Clark, Jim Clark, Karen Cornell, Dottie Craig, Mary Deel, Cheryl DeWitt, Donna DeWitt, Julie Dragoo, Sheryl Fallon, Dallie Forgey, Marlene Hoffman, Nancy Hood, Jeri Howell, Rick Howell, Joan Hudak, Beth James, Jack James, Doris Lanham, John Milhoan, Debbie North, Ollie Tipple, Betty Plymale, Debbie Rhodes, Sue Ruff, Gene and Sara Spurlock, Janet Wetherholt, Chris Williams, Mary Withee, Karen Luckydoo, Don Baker, and Denise Payne. https://www.mydailytribune.com/wp-content/uploads/sites/42/2017/10/web1_SAM_6012.jpgORTA District Director Don Baker is pictured with Gallia County Retired Teacher President Ollie Paxton, right.